Victoria Finlay: In the past 20 years you have seen a great deal of the conservation movement through your work with Prince Philip. What is your impression? Sir Miles: Conservation has played a major role in Prince Philip’s working life, and most of the time I was with him he was International President of WWF. So, especially in the first years I was lucky enough to spend a lot of time with him, travelling everywhere from the middle of Africa in the bush, to Siberia, to the tips and edges of parts of South America, to wherever. Working for somebody like Prince Philip, you get to hear a lot of questions being asked. He’s a great, “Why did you do that?” person. He is interested in an enormous number of things, from how motor cars are built to “why does this happen?” He has a hugely inquisitive nature. And if you are a man of such international prominence and you ask such questions then people have got to give you the answer. And very often, the first answer wasn’t good enough. If Prince Philip thinks you’re talking rubbish, he’ll say: “That’s not the answer. What is the answer? Have you tried it this way?” It was absolutely fascinating to watch this expert in action. And this approach applies to how he tackled so many other things, not just conservation; he’s the chancellor of two major universities. What did you see of his work with ARC? Martin [Palmer, director of ARC] is an enthusiast – and an enthusiast who knows so much about the system that he managed to engage Prince Philip’s attention and interest through all those years. The work with ARC did mean quite a lot of travelling and it also meant that HRH was sometimes in the position to say to Martin: “Well, I don’t think you’re doing that right, why aren’t you doing it this way?” I’m quite sure there must have been moments where ARC probably thought: “What’s he on about?” and in some cases he probably wasn’t right. On the other hand, from his very wide experience of charitable work, and also of his experience all around the world, seeing a great deal and learning from what he saw, I think he was able to contribute quite a lot. And, I presume, his involvement with ARC was able to bring a certain amount of kudos, which the conservationists wouldn’t be terribly interested in, but if you’re in the business of trying to attract big businesses on board, or governmental support, I think that’s probably where Prince Philip’s involvement was of great practical help. The thing about him of course is that he was able to bring the public gaze on to the problem rather like a searchlight. And the charity (whether it was WWF or ARC or some other organisation) was able to make use of this. And I think his presidency of the WWF was, for the early part of the time I worked with him, the major driver of all the things he did. So the Siberia trip for example, or the middle of Africa, those were WWF presidency visits? And would he have been able to see conservation programmes in action in those places? Of course. We went to northern Siberia in summer, where the ice is normally 20 feet deep during the winter. There was a beach and waves breaking onto it and we stayed there in a wooden house. During the winter the people normally just throw the rubbish out into the snow. But of course when the summer comes all the snow is gone, so around all the buildings there is an absolute pile of rubbish. But if you go to any overpopulated area, there is going to be a drain on the natural resources. Humanity places demands on the environment, or the energy sources, or the ability to grow things. If you go to deepest South America, or mid Africa where the jungle is virtually untouched, the population there is quite small. But if you go to other parts of the world, China for instance or places in Europe, every bit of land is put to use. There is no land left lying fallow. Unless it is in the middle of the desert. HRH has a very clear view of conservation. I think he was before his time in many ways. Obviously there are academics who have paid an enormous amount of attention to the issue. But what Prince Philip brought to the table was, firstly, a great deal of knowledge and practical experience of watching these sorts of people at work. And secondly, having the ability to talk to the President of any country, to say: “I’ve just been to this region, and the deprivation is really appalling and, speaking as the president of WWF, I wonder whether there is something you can do about changing this?” And of course WWF was very happy to produce the guidance to help that country achieve the aims he was suggesting. Really, “catalyst” is the word for what he did. Did you see this having effect? Very often we never saw the effect ourselves, but the effect was quite evident for the people who followed it up. What you are then looking for, as the Head of State, is the means to achieve what has been suggested. And in poorer countries that’s often international aid. Because HRH was head of WWF, they had an ‘in’ to certain funds which were available to the poorer countries. Had you much knowledge of conservation previously? I was lucky enough to be the British Commander in Nepal for two years. The whole of that country is extremely poor. When you have people relying on crops from paddy fields the size of this room – if they’re lucky – and there’s no mechanised farming, then it’s hard, back-breaking labour. For those two years I also ran the Gurkha Welfare Trust. We had about 15 offices around the country where we provided a certain amount of funding for ex-soldiers who had become destitute. But more importantly we gave a degree of guidance in farming. Like anywhere else, unless you feed the land, you don’t get the same return on what you’ve sown and men who have spent their whole lives in the army need to learn this. So we ran resettlement courses to teach retired Gurkhas to stop being soldiers and to go back to being agriculturalists working at 4,000 to 7,000 feet above sea level. Or, if they’ve settled in the plain, we would teach them how to farm that kind of land properly. Do you think that working with the faith leadership as well as the secular leadership is actually helpful? Yes. Terribly. Because you immediately involve the average individual. Take, say, a peasant farmer in Nepal. When he sees the tie-up between his Hindu religion, his livelihood and making right use of nature, you can actually do quite a lot. You can help him use his religion to improve his farming, through giving him a greater sense of his agricultural responsibility. It’s got to be done with sensitivity and not in a complicated way, but there are very obvious, practical results. If you just grow rice and don’t feed the land or rotate the crops in some way, you are not going to get the returns you want on your investment. To put that across to peasant farmers, in parts of the world where the weather is awful and the soil is poor, is quite a challenge. But if you can relate it to the protection of the gifts given by our maker, whether it be Allah or a Hindu god, or Christ or whatever, you have a good hook on which to hang your coat. So people see the practical results but they also get the satisfaction that there is a religious driver to it. In some cases it’s in the foreground and in some cases it’s in the background, but it’s there. It is interesting for ARC that religion and agriculture are interwoven in so many places. Can you say a little about your life? I was born in South Africa, in Johannesburg in 1938. My mother was South African: her mother was Scots, and her father went out from London for a ‘brave new world’. My own father was in the Australian Army in the First World War [he fought at Gallipoli] then settled in South Africa between the wars where he met my mother. My parents divorced when I was a boy and my brother and I went to school in Port Elizabeth. When I left school, academically not very successfully, I went to work for a British company in South Africa and then moved to the parent company in London. When I was about 24 I decided to become a regular officer. I was far too old to go to Sandhurst, so I joined as a three-year officer and I passed out as top cadet of my intake. While I was doing that I met the officer who ran the training. He said: “What regiment are you going to?” and I said I was going to the Queen’s Royal Regiment. He looked me up and down and said: ”No you’re not, you’re going to the Gurkhas…” So I went to the Gurkhas. Did you know what the interview was for? Yes. I had met HRH’s previous private secretary [Sir Brian McGrath] in Nepal a few years before, because he came out with the Queen and Prince Philip on a state visit, and I had spent the best part of an afternoon that day with Prince Philip. I got the job as his assistant private secretary and after about 18 months they said: “Would you like to become the private secretary?” Nineteen years later I retired. What do private secretaries do? Yes I’m sure he has, he’s got a twinkle. But more than that, he has this eclectic knowledge, he’s so widely read. Any moment he has, he’s reading a book. And would he at the same time be talking to religious people? Yes certainly: in the context of conservation, he’d talk to anybody and everybody. And as president of WWF International, he was there not as HRH but President of WWF. He ran WWF very much as chairman of the board. The board meetings were ran in the same way as you would expect any to be run, but he brought to the table the ability to open doors which would not be possible with anybody else. What do you think is the biggest environment issue for the planet? Population. You have too many people using up too many limited resources. You can ameliorate that to a degree by teaching people to farm more economically to get the most out of the land and put back what they can in terms of nutrients. You can equally do it by giving people an example of things that they should grow instead of things that they are growing. When I talked to Prince Philip for an interview seven years ago, he said he first thought about the importance of working with faiths on conservation because he remembered how when he was growing up he learnt that his duty as a Christian was to look after nature. So he figured that people from other faiths would have similar thoughts. What do you think? I think if you’re a city dweller it probably doesn’t enter your mind. If you have an agricultural or a rural background then of course it does. You can see how the way you use your water affects the field. Or that if you cut down all the trees, you don’t have anything to burn on the long winter nights. You have to show people the solutions on a practical level. In India they preserve cow dung and they make it in to pats, which they dry and burn as fuel. It is a very good example of using this as a source of energy. You grow the crop, you feed the cow, they produce the milk, they poo, you gather the poo up, you dry it, you then burn it to keep your house warm. You don’t have to be a scientist to see that. You’ve watched ARC from a distance, what do you think of it? First of all, it’s seriously international. Second, it has touched a nerve that has not been touched in the same way before. The whole business of conservation is generally not approached from a religious point of view. It may happen like that, to a degree, from a temple in India or in a shrine in China. But in general terms, in terms of western civilisation, or governments, I think ARC is doing something very new. ARC has pushed a button that has got people interested through their religion rather than through their interest in the environment. There’s a long way to go. But because it’s an international organisation you can do this at a high level. Some of the conferences that you have had have to be at that top level but at the same time it is absolutely essential that it filters down. I’m proud to be involved. Brigadier Sir Miles Hunt-Davis was born in Johannesberg, South Africa in 1938. He attended St Andrew’s College in Grahamstown, and later moved to London where he first joined the Territorial Army and then became an officer in the Gurkhas. He served in Hong Kong, Borneo, Malaysia, Canada Britain and Nepal, and from 1985 to 1987 was the British Commander in Nepal. From 1987 to 1990 he commanded the Brigade of Gurkhas in Hong Kong. In 1991 he became Assistant Private Secretary to His Royal Highness Prince Philip, Duke of Edinburgh. From 1993 to 2010 he was HRH’s Private Secretary, travelling with him all around the world, including many visits to conservation programmes in HRH’s capacity as International President of WWF. He also visited several ARC projects and celebrations, including in Kathmandu 2000 and Windsor 2009. 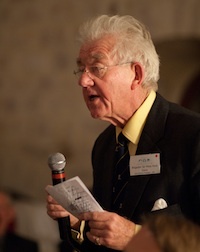 In 2011, on retirement from Buckingham Palace, Sir Miles became international president of ARC. Link here for ARC's 2003 interview with Prince Philip. Floor-coverings made from recycled bottletops, solar panels and recycled furniture are part of a low-carbon refurbishment of the Quakers' Friends House in London.